Q: How do I measure heart rate? A:The Gear’s heart rate app is intended for fitness and informational purposes only and is not intended for use in the diagnosis of disease or other conditions, or in the cure, mitigation, treatment, or prevention of disease. • If you have just purchased or have reset the Gear, create your profile. • If the measurement is very different from the expected heart rate, rest for 30 minutes and then measure it again. • The accuracy of the heart rate sensor can be affected depending on the user’s movements, personal physiology, and the measurement conditions and surroundings. • If the heart rate sensor is not working, check the Gear’s position on your wrist and make sure nothing is obstructing the sensor. 1 Tap Heart rate on the Apps screen. 2 Tap Measure to begin measuring your heart rate. 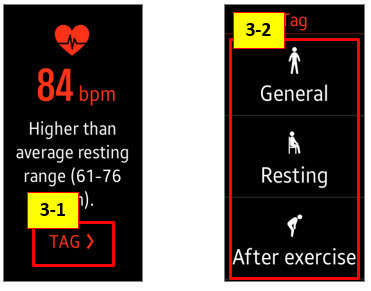 3 Tap TAG and select a status tag for your status to the measured heart rate.